I like the title of this book: Egg & I. It denotes a relationship. A kinship of sorts. The egg as my friend. And why not? Eggs are such a great source of protein and are so budget friendly (especially for those who have their own hens). Muscle & Fitness has a terrific article about the value of eggs, Food Fight: Chicken vs. The Egg ~ Which comes first? We pick the better protein source. After considering such variables as price, fat, protein, calories, sodium, cholesterol, and intangibles, the egg was declared winner. It's the perfect protein breakfast. Or lunch. Or dinner. So egg, I love you. Choose the right size pan. A three-egg omelet requires and eight-inch pan. The pan should be nonstick. Put a pat of butter in your nonstick pan. Place it on medium-high heat. Heat the butter to just short of brown and swirl it around the pan. Pour the eggs into the hot pan. Salt and pepper the eggs. When the eggs approach the consistency of cottage cheese with mostly solids and some liquid egg, stop stirring. Use the spatula as a paddle to pat the eggs down into an even layer. Place a plate over the top of the pan. The plate will trap heat and help cook the top of the omelet. It also warms the plate so that you can serve the omelet on a warm plate. Let the eggs continue cooking until the liquids are set and the top of the omelet is cooked. Place the fillings in a row across the omelet just off to one side. For most fillings, you will want them cooked. The omelet should slip around the pan without a hint of sticking. Move pan to a plate, tip the pan on angle over the plate, and gently shake the omelet onto the plate filling side first. When the omelet is about halfway onto the plate, twist the pan with your wrist folding the remaining omelet over that on t he plate. The omelet should be folded over the bottom edge protruding about one-half inch. 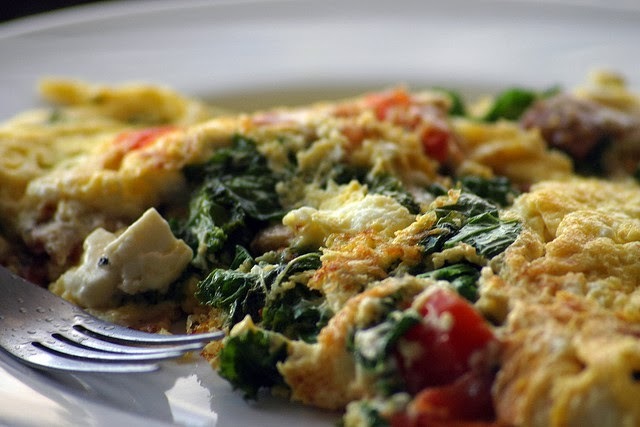 Omelet should be golden brown and puffy with the interior set and any cheese melted. A three egg omelet should cook in five minutes or less. For larger omelets, use larger pans.